Having one of the most famous faces in Eternity proves challenging when it comes to finding a way inside the secretive world of illegal soul peddling, and the only person Lana knows with the right connections is Tasha Henry, a former colleague and defeated rebel with a poaching record. The rogue reaper isn't going to be easy to track down, and even if Lana does manage to catch up with her, the real question is whether or not a shot at redemption will be enough to lure her away from the dark side. I am a HUGE fan of Ms. Harvey and have read and listed to each and every one of her books to date, short stories included. 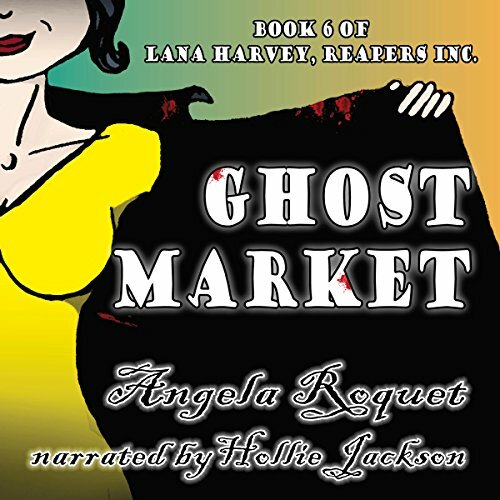 I have even turned my husband on to the tales of our favorite reaper, listening to the stories on long trips or to and from work. So it is with a sad heart that both he and I did not enjoy this latest installment. We both agreed this was more of a short story stretched out way longer than it should have. We were left feeling cheated, as things that seemed important to us, were left unaddressed or barely touched on at all. I wish I could say this book was good, but it by far the worst out of the bunch. It is only my long love and history with the characters that this gets 2 stars instead of the 1 I think it really deserves. The plot is getting more and more exciting. It is reaching a climax soon, I suppose. Angela Roquet is a good writer. Very good. I also find Hollie Jackson's performance/narration very good. Very good series. I have listened to and read every book in the series. I will probably do that FOREVER! I really like the quotes at the beginning of each chapter. A lot of work must have gone into these, I've really learned a lot!